A union has called on the Scottish Funding Council to investigate the appointment of Robert Gordon University's (RGU) new principal. Prof John Harper was chosen to lead the Aberdeen university after the departure of Prof Ferdinand von Prondzynski. The University and College Union (UCU) has alleged the decision smacks of "cronyism" and "jobs for the boys", by breaching good governance codes. RGU said the appointment was on a two year fixed-term contract. It said this was made in line with its recruitment policy and it claimed the union had "misrepresented" the action taken by the university's board of governors. In a letter to the funding council, UCU official Mary Senior said: "We are not aware that there has been any open appointment process for this post, denying other potential candidates the opportunity to come forward. "We are not aware that the appointment process enabled any student, staff nor trade union input to be taken into account. We are not aware that there was a selection committee which undertook any type of shortlisting of candidates. "We consider that Robert Gordon University has not adhered to the 2017 Code of Good Governance in this process." The UCU also questioned whether the appointment was in line with the government's policy of promoting equal opportunities. The principal's post was to become vacant when Prof von Prondzynski stepped down, following questions being raised about a potential conflict of interest. Mike Fleming, the chairman of RGU's board of governors has written to staff at the university explaining the appointment of Prof Harper. Mr Fleming said the appointment was "in line with the university's procedures and complies with the Scottish Code of Good Higher Education Governance". He added: "John is the ideal, experienced candidate for the position, with demonstrated leadership qualities and significant knowledge of the institution and the higher education sector." 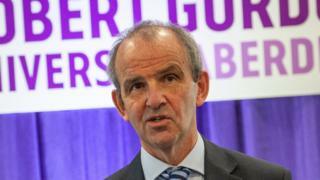 Commenting on the UCU's letter to the Scottish Funding Council, a spokeswoman for Robert Gordon University said: "We are disappointed that UCU continues to misrepresent the action that the board of governors has taken. "The board acted decisively to stabilise what was a difficult situation for the university. "There was full involvement of the board in the appointment and the governors were unanimous in their decision to appoint Prof Harper who has the overwhelming support and confidence of both the board and the staff." RGU said Prof Harper and the university's board had "mutually agreed" a two year fixed-term contract "to give him time to deliver the stability and move the university forward". The spokeswoman added: "Once the situation is stabilised the board will then consider the future leadership of the university." Responding to the news Prof Harper's appointment was for a fixed term, the UCU's Mary Senior said: "For two days Robert Gordon University said nothing about the fixed term nature of this contract, they have been reiterating to staff, students and the wider public that all was in order, when clearly it was not. "The fact remains that there was no process for appointing the head of the institution, and it's not UCU that has been misrepresenting the situation." She added: "While there's no issue with the senior vice principal stepping up for an interim period, this was never about Professor Harper, this is about due process, good governance and equal opportunities." A spokesman for the Scottish government said: "Universities are expected to adhere to clear, inclusive and transparent governance processes. Within that requirement, they rightly have clear, statutory autonomy and this appointment is a matter for RGU."